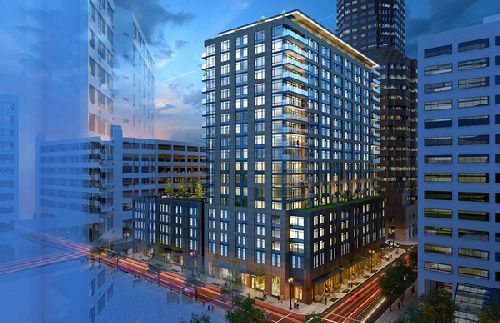 Alamo Manhattan has obtained $96.5 mil in financing for the development of 100 Columbia, a 348-unit, Class A+ high-rise multi-housing community in the Portland CBD. The four-year construction loan was arranged by HFF and funded through PCCP, LLC. 100 Columbia is located on a 0.92-acre site that spans the block bound by SW Clay Street, SW 1st Avenue, SW Columbia Street and SW 2nd Ave. The site, which has a WalkScore® of 93, will support what will be the nearest high-rise residential building to the Willamette River in the CBD. The site is also one block from Tom McCall Waterfront Park to the east and Keller Auditorium to the west and is within three blocks of the CBD’s core job center that is home to more than two million square feet of high-rise office. Due for completion in 2020, 100 Columbia will include a mix of studio, one- and two-bedroom ultra-luxury units averaging 817 sf in size. The 20-story development will feature premium interior finishes and community amenities, including an expansive 15k sf, sixth-floor amenity terrace and a 20th-floor rooftop resident lounge, which will open onto an observation deck offering unobstructed views of the downtown skyline, Mount Hood and the river. The property will also include a 16th floor rooftop terrace. In addition to the multi-housing component, 100 Columbia will incorporate nearly 15k sf of ground-floor retail, which will provide immediate convenience for residents and office employees in the surrounding area. HFF’s Mark Erland, Matt Benson and Charlie Watson arranged the financing. HFF also assisted Alamo Manhattan in securing joint venture equity for the project in a transaction that closed in May 2018.